An orzo salad recipe like this is one of the many orzo recipes you can use to create a colorful pasta salad with tasty summer ingredients. This orzo salad has great texture, flavor, and looks stunning on any table spread. While orzo looks like rice, it’s actually a type of short-cut pasta, making this orzo salad recipe equivalent to a pasta salad. Orzo pasta cooks in about the same time as any other kind of pasta does, which is typically around 10 minutes. While orzo pasta is similar to rice in its carbohydrate content, orzo delivers nearly twice the amount of protein. Orzo is also low in fat and makes for a light option to use in a refreshing summer recipe like this. 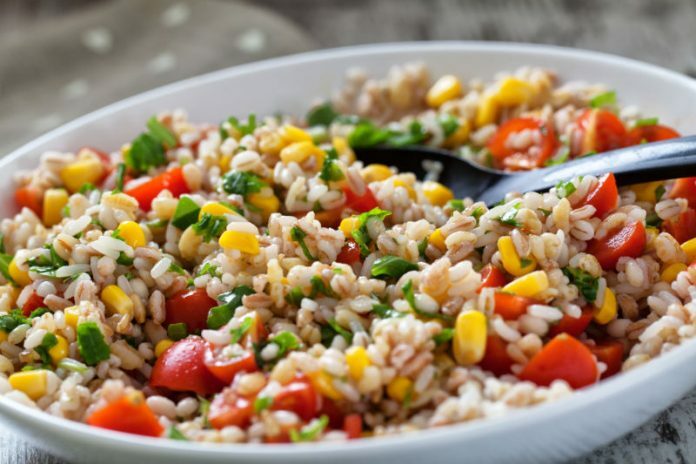 To create this easy orzo salad, you’ll want to use a handful of summer ingredients like peaches, tomatoes, basil, and corn. Other ingredients like jalapeños and green onions add wonderful heat to the recipe. The orzo salad dressing in this recipe is also incredibly easy to whip up. Made with both honey and lime, you can expect a sweet and tangy flavor that will have you finding this orzo salad recipe absolutely irresistible. Cook the orzo pasta according to the directions on the package (typically 10 minutes in boiling water). Drain the orzo and run under cool water. Add the orzo to a big bowl. Add all of the chopped and prepared ingredients to the orzo including the corn, tomatoes, peaches, jalapeño, green onions, basil, and salt and pepper. Temporarily set aside. In a separate bowl, combine the dressing ingredients together with a whisk. Pour over the entire salad and gently stir everything so that the dressing coats all of the salad ingredients. Cover with a sheet of plastic wrap and refrigerate until cool.